Your back muscles consist of an intricate design of interweaving muscle fibers. While each muscle group has a specific job, they all work collectively to support core movement, protect the spinal column and prevent injury to this vital area of the body. A variety of exercises exist to challenge specific muscle groups, but very few of these exercises challenge and fatigue such a wide array of muscle fibers as V-bar pulldowns. Muscles Targeted: The primary targeted muscle group for this exercise is the latissimus dorsi, or “lat” muscle, which is the widest and most powerful muscle of the back. Found along both sides of your torso, these triangular-shaped muscles assist in a variety of movements, such as breathing, swimming, pulling, carrying and bending. Like most other strength training exercises, V-bar pulldowns activate numerous secondary muscle groups, which act as stabilizer muscles during the exercise and also when the lats are used in daily life activities. These secondary muscle groups include the middle back, shoulders and biceps. Exercise Instructions: Position yourself securely in a lat pulldown machine. With a secure grip on the V-bar attachment, slowly pull the weight straight down in front of you until it is about even with the middle of your chest. Focus on using your back muscles as the primary movers during the movement. Pause for a brief moment at the bottom of the exercise and then slowly return the weight back up to the starting position and repeat. Why This Exercise is Important: The obvious benefit of V-bar pulldowns is the muscle-isolation within the back. Strengthening your lat muscles provides the ultimate layer of support for core movements. Whether you’re involved in sports or simply need more stability throughout daily life, training these muscles offers injury-prevention and athletic benefits. Weakness in your lats decreases mobility in rotating your trunk while making your back more vulnerable to injury. Things To Avoid: If you’re recovering from a back, shoulder or bicep injury, you must carefully introduce this exercise into your fitness routine. Never progress to lat-specific weight training without the direct consent and oversight from your physician or personal trainer. In terms of the amount of weight to use, choose a lighter weight when first starting out. The pulling motion of this exercise places strain on your lower back. Weak abdominal muscles or lower back muscles enhance the possibility of accidental injury. During the actual exercise, keep movements slow, controlled and fluid. Avoid jerking the weight as these sudden movements make you more susceptible to muscle tears and other injuries. Reps and Sets: The number of repetitions and sets is directly based upon your fitness goals. According to the American Council on Exercise, perform 1-2 sets of 8-15 repetitions if you’re just starting out. Experienced lifters wishing to enhance muscle strength should undergo two to six sets of four to eight repetitions while resting two to five minutes between each set. To gain muscle mass, not necessarily muscle strength, perform three to six sets consisting of six to 12 repetitions while resting 30 to 90 seconds between each set. Remember, the goal is to choose a weight that sufficiently fatigues your muscles by the end of the last desired set and repetition. Discovering this amount of weight requires constant adjustment based upon strength increases and muscle group weaknesses. Lying Back Presses or “Superman” – This equipment-free exercise uses your own bodyweight to isolate the entire upper and lower back muscles by lying face-down and lifting the shoulders and legs off of the ground. 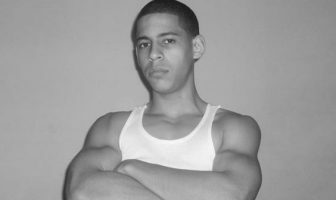 Two Arm Dumbbell Rows – With a pair of dumbbells, bend over with a flat back and pull the weights up towards your chest. Place your feet securely on the floor and bend your knees to reduce lower back pressure. 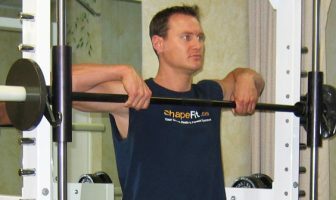 Seated Cable Rows – This is similar to V-bar pulldowns as the pulling motion of this exercise activates the lat muscles. This exercise requires a specialized machine and you will perform it by pulling the cable in toward your abdomen.